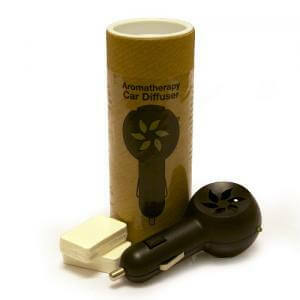 Electric aromatherapy car diffuser (including 10 pads). A safe and very effective way of subtly releasing the aromatic properties of aromatherapy essential oils whilst driving. Instructions: To minimize skin contact. Slide the pad partly into the slot in the diffuser, leaving enough of the pad visible to drop oil onto. Then add 4 to 6 drops of essential oil or fragrance oil to the pad and the tilt the diffuser back so the pad slides fully into the diffuser. Plug the diffuser into the cigarette lighter outlet. The diffuser fits quite tightly into the outlet, but will loosen after several uses. To ease removal for the first few uses press against the car trim whilst pulling out the diffuser. Add additional oil every 2 days. Replace the diffuser pad after 8 to 10 uses or when the pad loses its absorbency. irritation. Do not allow the car diffuser pads or oil to come into contact with car interior.